Whether you have a single iPad for your class to share, a small group of devices, or one iPad for every student, you should check out our management tips. Here you'll find videos, recommendations, and maintenance strategies galore. 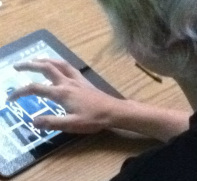 One iPad in the classroom is tough to incorporate as a whole class activity, so we have a few different ideas for you. Click on the link HERE for a couple different testimonial videos from middle school students as well as management thoughts and tips for a single iPad in the classroom. If you are using more than one iPad, but fewer than ten iPads, then you might consider using iPads in Learning Centers - even at the secondary level. Click on the link HERE for suggestions on how to use and manage several iPads in the classroom, as well as a video featuring student thoughts on using iPads as part of learning centers in a middle school classroom. Using a class set of 20+ iPads is a phenomenal experience, but it is not without it's own difficulties. Click on the link HERE for suggestions on how to use and manage iPads on a 2:1 basis (2 students per 1 iPad) or a 1:1 basis (1 student, per 1 iPad), as well as a video featuring student thoughts on using iPads.